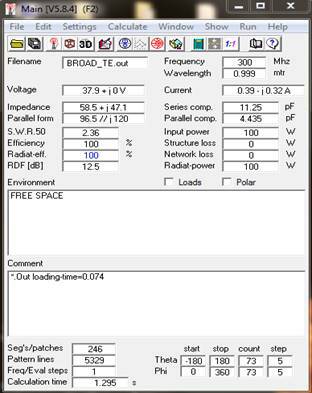 Usually the radiation pattern of a single element is relatively wide, and each element provides low values of directivity (gain). In many applications it is necessary to design antennas with very directive characteristics (very high gains) to meet the demands of long distance communication. This can only be accomplished by increasing the electrical size of the antenna. Enlarging the dimensions of single elements often leads to more directive characteristics. Another way to enlarge the dimensions of the antenna, without necessarily increasing the size of the individual elements, is to form an assembly of radiating elements in an electrical and geometrical configuration. This new antenna, formed by, is referred multielements to as an array. In most cases, the elements of an array are identical. This is not necessary, but it is often convenient, simpler, and more practical. The individual elements of an array may be of any form (wires, apertures, etc.). The total field of the array is determined by the vector addition of the fields radiated by the individual elements. This assumes that the current in each element is the same as that of the isolated element (neglecting coupling). This is usually not the case and depends on the separation between the elements. To provide very directive patterns, it is necessary that the fields from the elements of the array interfere constructively (add) in the desired directions and interfere destructively (cancel each other) in the remaining space. Ideally this can be accomplished, but practically it is only approached. 2. The relative displacement between each element. 3. The excitation amplitude of the individual elements. 4. The excitation phase of the individual elements. 5. The relative pattern of individual elements. 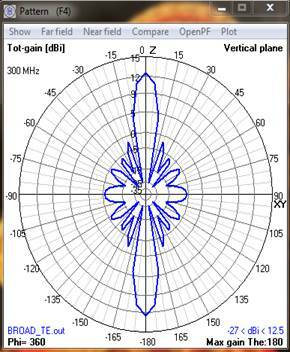 Linear array: If the antenna elements are equally spaced along a straight line known as linear array. Uniform Linear array: AUniform Linear array is one in which the elements are fed with a current of equal magnitude with uniform progressive phase shift. Calculate wavelength of dipole using the formula Î» = c/f , where c= 3*108& fis the frequency. 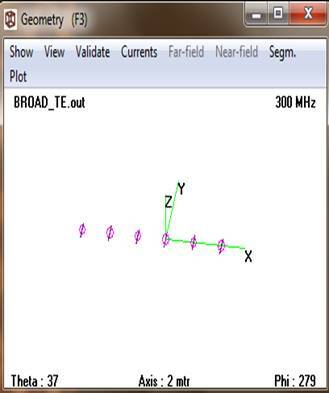 In Broadside array the maximum radiation is perpendicular to axis of antenna array i.e. at 90o and 270o and the maximum radiation can be obtained by increasing number of elements. 1. Model the Broad side Array.